Over the years, one observation about large and mid-sized business has been remarkably consistent – when marketing and sales are not properly aligned, companies fail to make their projected numbers. The predictable result is internal finger-pointing and navel-gazing, neither of which yields the desired result: more revenue and profitable customers. There are many approaches for aligning sales and marketing, but the one we find to be most effective is to focus all eyes on customer value. Successful businesses are built through consistently creating and delivering value. The question is, how do leading companies do that? From a business perspective, it all starts with building an organization that stays focused on understanding what customers truly value, and what are they willing to pay for. 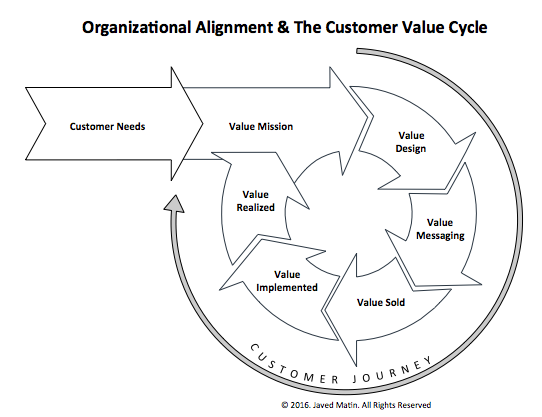 This requires an organizational design and alignment that puts the customer at the center of the universe and aligns all its functions towards creating, delivering, and realizing customer value. But it’s not enough to deliver value. The customer must realize the value they paid for. Value realization is a journey that involves a continuum of every touch point between the customer and the vendor. And most importantly, the product or solution must be implemented in the right way to ensure the customer realizes the value they expect to receive. This takes more effort – but it’s what separates the best companies from the pack. Companies must always keep in focus current and evolving customer needs as they define and execute their value mission. Value design is a critical phase in value creation as it translates the market needs and the company mission into tangible products and services. The ability of marketing to accurately translate product and service attributes (features/functions/value) and how they best address the needs of the customer determines how effective the company is in taking the value message to market. Similarly, the selling methodology and process employed by the sales team must closely align with the buyer’s needs i.e. what business problems will the product/service solve? How it will solve it? How should it be deployed and used? 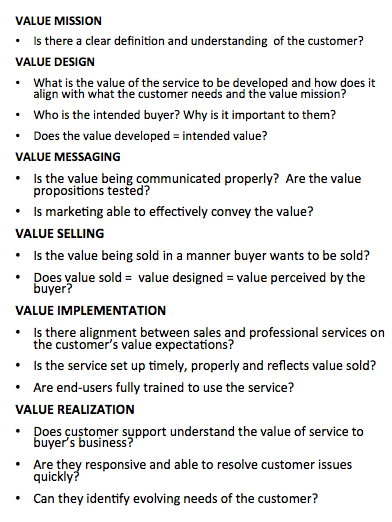 It is critical to ensure buyer’s expectation of the value is in line with real value potential of the product/service. One of the common obstacles to delivering value to meet customer expectations is the how – how is the product actually implemented in customer’s environment? How are end-users trained? As the customer embarks on their value journey, the quality of service delivered by customer support becomes critical. Let’s stress this again: the only way to achieve real, constructive alignment between sales and marketing (and the entire organization) is to organize all activities around customer value. Javed Matin is an independent management consultant helping B2B companies accelerate revenue growth through sales and marketing optimization. Over the past twenty years, he has developed global sales operations programs, training and effectiveness audits across multiple industry sectors.